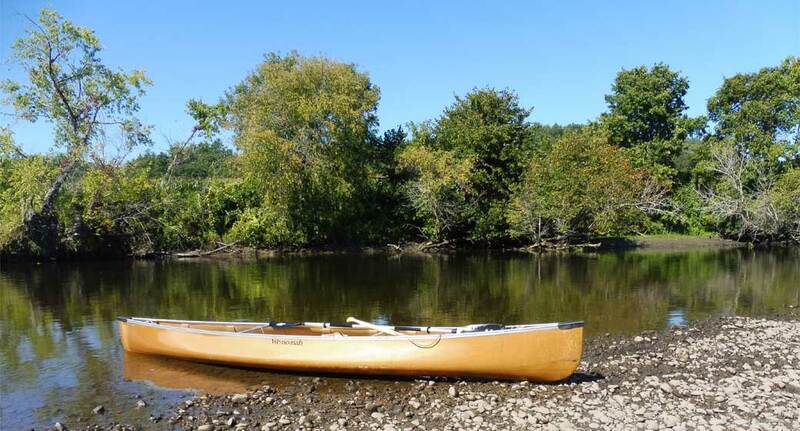 My parents gave me a beautiful Mansfield 13-foot canoe as a college graduation present which I immediately destroyed on a run in the Schroon River around Chestertown, NY. As with anything, hopefully you learn and improve as you go and I can confidently say in this area I certainly have. Both in my whitewater paddling and canoe repair skills. 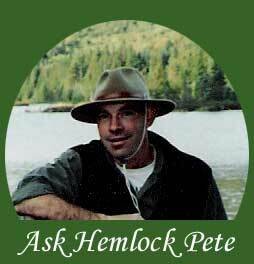 I have replaced gunwales and seats, repaired an incredible variety of cracks and major breaks, resurfaced skin coat Kevlar, etc., etc. Give me a call or drop me a note. 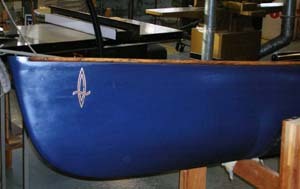 Whether you have a royalex, composite (Kevlar, glass, or carbon fiber), wood, or plastic hull. I can probably fix it. Check out some of the repairs I have done, along with some before and after photos, below. 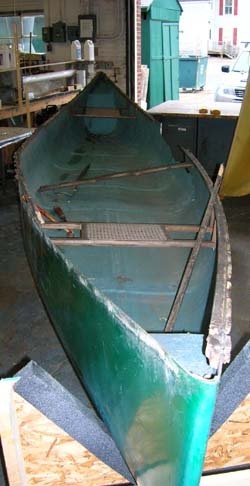 This canoe had badly weathered gunwales, a broken seat frame, several areas of rot in the gunwales and decks, and the hull was severely oxidized. 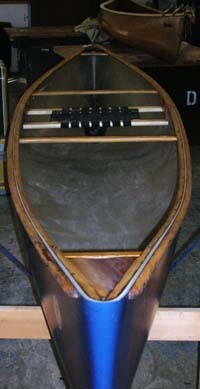 The goal was to save the gunwales vs. replace them, replace the seat and brighten up the hull. Mission accomplished. 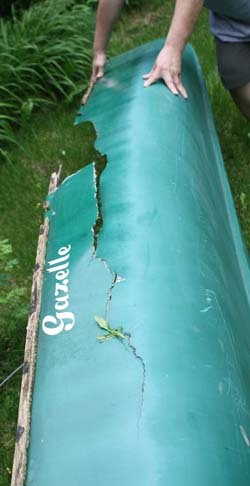 This canoe was by far the biggest repair challenge I have ever had. It had been stored on the ground outside for many years which rotted all of the woodwork and finally a tree came down on it during the winter of 2013 almost breaking it in half. I made no promises to the owner other than I would try. Actually I tried to convince him it was not worth the time, effort, and money. He wanted me to try. 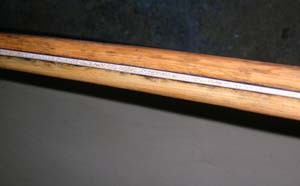 I put on new white ash gunwales, and cherry decks. I had to repair many cracks and replace a large section of the hull. The keel line looked like an old sway back horse so it had to be pushed back in line and stiffened, which I did by adding several graphite ribs. The ultimate goal was to make it functional again. I believe we did a bit better than that. The owner was quite pleased. I get quite a few Kevlar skin coat hulls that have been neglected. Kevlar is a tough material to work with as it does not sand smooth like fiberglass or graphite. 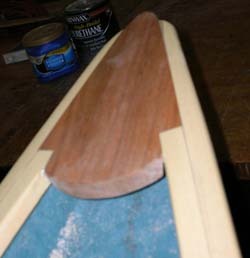 It fuzzes up terribly making it hard to get a smooth finish which is what you want on a skin coat hull. This particular hull, as with most, was left outside for many years. Unfortunately the bare resin has no UV protection and eventually breaks down. It basically crystalizes and crumbles like sugar exposing the cloth. By the time I removed all of the crystalized resin I was down to cloth on 85% of the hull. While I cannot get rid of the cosmetic scratches in the cloth, I can give you an almost factory mold finish to the hull. When done I apply several layers of UV protective varnish; however I hope you learn your lesson and keep it stored out of direct sunlight. I wish I had taken some before pictures. Unfortunately I did not. Another very happy paddler.